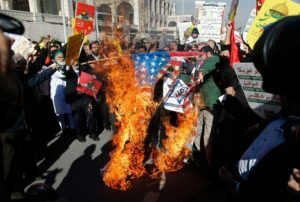 President Donald Trump’s decision to recognize Jerusalem as Israel’s capital and plans to move the U.S. embassy to the city gives Muslim states an opportunity to unite and sever ties with the U.S., the deputy speaker of Iranian parliament said. “The least move the Muslim states can make is to summon the U.S. ambassadors for explanations; yet basically, they had better show action and cut off relations with the U.S.,” Ali Motahhari told Fars News Agency on Dec. 9. On Dec. 8, senior Iranian cleric Ayatollah Ahmad Khatami urged Palestinian Arabs to stage an uprising against Israel following Trump’s move. Meanwhile, an aide to Palestinian Authority (PA) chairman Mahmoud Abbas confirmed on Dec. 9 that Abbas will refuse to meet with U.S. Vice President Mike Pence later this month. Senior PA official Jibril Rajoub had said on Dec. 7 that Pence was “not welcome in Palestine” during his upcoming visit and that Abbas will not welcome him because of the statements Trump made about Jerusalem. Egypt’s Coptic Pope Tawadros II also canceled a meeting with Pence, with the church saying it “declines to receive” him in protest of Trump’s announcement which the church said failed to take into account the “feelings of millions” of Arabs.